Allan Glasgow, the 2011 American Bass Anglers champion, will challenge top professional anglers and a mighty river during the 2012 Bassmaster Classic, slated for Feb. 24-26 on the Red River in Shreveport, La. He earned this honor by winning the 2011 ABA Toyota Tundra Bassmaster Weekend Series National Championship on the Santee-Cooper lakes near Summerton, S.C last November. Throughout the year, Glasgow competed in various events in the ABA Alabama North Division 1. He advanced to the regional championship and finally to the national championship tournament where he emerged as the top angler in the Boater Division. "It's always been my goal to fish the Bassmaster Classic," said the owner of a plumbing company in Ashville, Ala. "I'm very excited that it will happen this way. I have fished against some of the top pros before, so I don't think I'll be intimidated by them. I'd love to come home with a victory for ABA at the Classic." A victory at the Bassmaster Classic would seal Glasgow's immortality as a top fisherman and propel him into a full-time professional angling career. For winning the most prestigious event in competitive fishing, the champion takes home a check for $500,000, but could pocket far more than that in product endorsements. Glasgow and the others will fish one of the best bass rivers in the nation. Flowing down from the southern Great Plains, the crimson stream slashes across about 250 miles of Louisiana until it joins the Mississippi River through a series of water control structures near Simmesport, La. In the 1980s and 90s, the U.S. Army Corps of Engineers divided the once raging river into five placid pools, much like the Tennessee River. Besides controlling the flow, the locks raised water levels, inundated forests and reconnected many backwaters to the main channel. Water clarity improved and fish flourished in the new system. Thanks to stockings of Florida bass, the system now produces a lot of 4- to 8- pound largemouth bass, plus some double-digit fish approaching 13 pounds. The anglers will launch at 7 a.m. each morning from the Red River Marina on Highway 71 South in Bossier City. The weigh-ins will begin at 3 p.m. each day at the CenturyLink Center at 2000 CenturyTel Center Drive in Bossier City. The public may attend both events. While the anglers look for bucketmouth bass, fishing fans may explore the Bassmaster Classic Expo at the Shreveport Convention Center, located at 400 Caddo Street in Shreveport. The show opens from noon to 8 p.m. Friday, 10 a.m. to 7 p.m. Saturday and 10 a.m. to 4 p.m. Sunday. In support of Glasgow and cheering him on, ABA members will staff Booth 19 at the Expo. Ray Scott, the founder of the Bass Angler Sportsman Society and the man who began the Bassmaster Classic, will sign autographs and meet with fans in the ABA booth starting at 11 a.m. on both Saturday and Sunday. Scott now serves as the ABA national spokesperson. 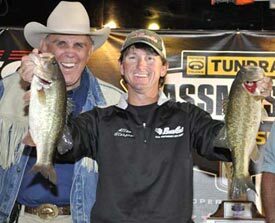 Fishing fans may also come by the ABA booth to meet Morris Sheehan, owner of American Bass Anglers. He will greet fans beginning at 2 p.m. Friday, 3 p.m. Saturday and 10 a.m. Sunday. In addition, fans may win various prizes from some ABA sponsors in hourly drawings or receive special show discounts on membership plus free gifts for new members. Some prizes ABA will give away include U.S. Reel fishing reels, Odyssey marine batteries, Simms rain suits, a $900 value, two full sets of Carlisle tires, plus hats, shirts and other items.